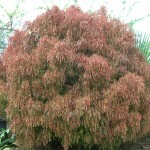 The Colorful Copperleaf Shrubs - Richard Lyons Nursery, Inc.
← We Finally Approach the Dry Season! 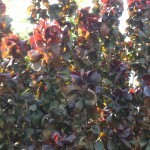 In many parts of the United States, the copperleaf is a popular summertime landscaping element, a heat-loving annual bedding plant that disintegrates with the onset of winter conditions. But it’s really a perennial evergreen shrub, and we in southern Florida are fortunate to be able to grow it inground or in containers year-round, allowing it to achieve dimensions unknown north of the subtropics. 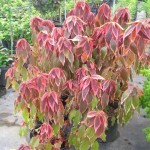 Copperleaf is certainly an apt name for most members of the genus Acalypha. 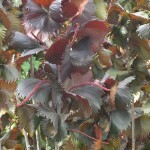 When grown in full sun, leaves of those cultivars achieve various hues of red, as if they are sheets of copper beginning to oxidize. Acalypha wilkesiana is probably the variety most people first think of when the genus is mentioned. The leaves are 5-8 in. long, with serrated margins. The plant, if left to its own devices, can reach 10 ft. high by 10 ft. broad. That makes it useful as a screening material. But this variety is also amenable to being pruned hard if greater compactness is a goal. 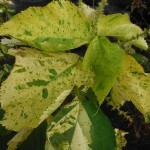 Richard Lyons’ Nursery carries one of the more unusual A. wilkesiana cultivars, ‘Java White.’ Instead of the standard red coloration, it has multiple hues—white, light yellow, chartreuse, and green. 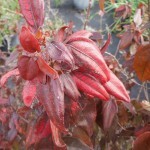 Another cultivar, A wilkesiana ‘Fire Dragon’, is also recommended. It differs from the original form in a couple of ways: The overall size is smaller, and the leaves are narrower, with a pronounced pink accent around the margins. Some say the foliage reminds them of that of Japanese Maple. A. wilkesiana ‘Inferno’ and ‘Firestorm’ are similar to one another in that they both feature shorter stature and narrower leaves than the standard A. wilkesiana. However, ‘Inferno’ hues are in the orange-yellow-red range, while those of ‘Firestorm’ lean more toward oranges and browns. 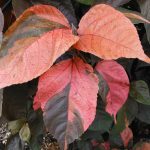 While all the copperleaf varieties attain their best color when planted in full sun, they can also tolerate some filtered light. They like ample soil moisture, but also good drainage. These popular Acalyphas are available at the nursery in 1-gal. and 3-gal. containers.